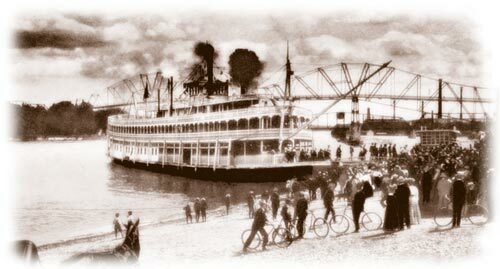 The original Grand Excursion passed along this stretch of the river on their first night on the river. It was their loss. Upstream from the bustle of the Quad Cities, the towns along the river scale down to quiet villages full of houses with great views of the river. The pace picks up in Clinton, Iowa, where a huge Archer Daniels Midland corn processing facility on the river keeps legions of railroad cars rumbling through town. Today, this stretch of the river is home to a number of recreational and historic attractions. The Great River Trail carries bicyclists along the entire east side of this stretch of the river. On the west side, bird watchers may want to hike through the river bottoms where the Wapsipinicon river joins the Mississippi in the Upper Mississippi National Wildlife and Fish Refuge and the Princeton Wildlife Area. For some small rivertown flavor, check out the arm-wrestling competition held during Camanche Days. The area was settled by a handful of hardy souls beginning in the 1830s. The town of Camanche, Iowa, (to pass for a local, pronounce it kah-MANCH) was named by Dr. George Peck, who platted it in 1835, and named it after the southern plains Indian tribe. His investment in the land paid off when a ferry was established to the new town of Albany, on the Illinois side of the river. If your historical interests go way back, visit the Albany Mounds Historic Site, on the south edge of town, where you can walk through woods and restored prairie among Indian mounds built by the Hopewell Culture about 2,000 years ago. On the highway just downriver from town, a dike and large pump maintain the Meredosia Levee and Drainage District, which drains former wetlands that now produce robust corn crops. You wont find these drainage districts much north of Dubuque, but they are more common farther south. The city of Clintons history can be found in the riverbottoms and the city streets. Beaver Island, a large island across Beaver Slough from south Clinton, was home to about 200 self-sufficient farmers and river rats who endured regular flooding until they abandoned their homes after World War II. The fashionable mansions of the lumber barons still line the curbs on 5th, 6th and 7th Avenues in the city. Clinton plans to dazzle Grand Excursion visitors in 2004 with their Things To Do With a River View riverfront rehabilitation project. While this project is still in the funding phase, it promises to upgrade the attractions in Riverside Park including transient slips at the marina, the showboat theatre, and the Lumber Kings minor league baseball stadium. For a taste of area history visit Heritage Canyon historical park in Fulton, Illinois. Fulton is also home to one of only two fully operational authentic Dutch windmills in the nation, right on the Mississippi. The mill is open for tours in the summer.